Ripon Cathedral is among the board members for Ripon Together. An exciting vision to make Ripon a better place will be unveiled by Ripon Together next month. In a major city-wide collaboration, Ripon Cathedral, Harrogate and Ripon Centres for Voluntary Service (HARCVS), Ripon Chamber of Trade, Ripon Civic Society, Visit Ripon, members of Blow Your Horn Ripon and the business community, have set up Ripon Together as an organisation to drive forward new and innovative projects to benefit the city. A meeting at Ripon Spa Hotel on February 1 at 7pm is open to anyone who would like to find out more about Ripon Together and what its goals are. Members of the board are keen for as many residents and community groups as possible to get involved to share their ideas or even spearhead projects to make a difference. The Chief Executive of HARCVS, Karen Weaver, said: “We are excited about this opportunity to harness community action and involvement in the community. The Dean of Ripon Cathedral, the Very Rev John Dobson, said: “The vision is for many more people to get involved by becoming members of the company - the cost is only £1, and by getting involved with initiatives. 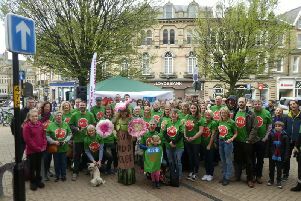 “It is not that the Ripon Together organisation takes away the need for others to organise and do things, it is to strengthen the city community by inspiring and helping to coordinate the efforts of groups and individuals.